The Association of Southeast Asian Nations (ASEAN), the present-day ASEAN Community, is marking the 51st year of its formation and development (1967 - 2018). For over half a century, ASEAN has been looking forward to a highly inclusive, highly competitive and strongly united community of 10 socially responsible Southeast Asian peoples. With the formation of the Community, ASEAN has built the 2025 Vision towards a self-reliant, rule-based and people-centred region that plays an increasingly important role in addressing regional and global issues. However, to seize that opportunity, ASEAN has to overcome numerous challenges in economy, education, environment and security. In this article we want to highlight current challenges in security and economic growth against ASEAN. On August 8, 2017, ASEAN marked its 50th anniversary. Founded in the toughest period of the Cold War in 1967, ASEAN has developed into a key part of the Asia - Pacific political structure. The adoption of the draft framework for the Code of Conduct in the East Sea (COC) on the occasion of the 50th ASEAN Founding Anniversary is considered a major step forward for regional peace. Nevertheless, ASEAN is still facing numerous challenges, especially in regional security, stability and solidarity. Lying on one of the most important maritime routes in the world, ASEAN is facing many challenges in maintaining security and safety in these waters, particularly with the rise of piracy and armed attacks. Meanwhile, intensified and complicated territorial and sovereignty disputes over the sea and islands in the region and in the East Sea erode confidence and affect peace, stability, security and safety of maritime and aviation in the area. The East Sea has long posed great challenges for ASEAN, as four out of 10 member states spar over islands and resources in the East Sea. 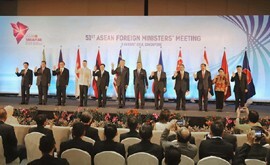 At different levels, countries involved in the East Sea dispute expect ASEAN, as a multilateral instrument, to take a unified stance on the dispute over the islands in the East Sea with China. According to Singaporean Prime Minister Lee Hsien Loong, the East Sea issue has become a ‘barometer’ of ASEAN unity and trust. Spats over islands in the East Sea have challenged the principle of consensus that the bloc has pursued, as some members have economic and strategic interests that are largely dependent on China. The unstable security in many parts of the world as well as threats from the Islamic State (IS) has also affected many ASEAN countries. Terrorist and extremist threats, which have endangered the region for years, have now become the most serious challenge for ASEAN as it faces the risk of becoming a new IS area. Hundreds of Southeast Asian IS warriors have repatriated from battlefields in Syria and Iraq and contacted local terrorist groups. A series of terrorist attacks in Indonesia and Malaysia, particularly conflicts between pro-IS insurgents and Philippine government forces in Marawi, southern Philippines, together with the terrorist occupation in this city, show IS’ intention of gradually forming an ‘outpost’ in Southeast Asia. This has posed a serious threat to the national interests and security of each member state, as well as to the Southeast Asian stability. For ASEAN, the challenge of ensuring security and safety in the East Sea is one of the most prominent issues. In August 2017, ASEAN and China made new progress when they agreed on a draft COC framework, paving the way for future negotiations. The search for consensus among ASEAN countries or between ASEAN and China in promoting legally binding documents, with the strict compliance of concerned countries, will also be a considerable challenge. Consensus is the core principle of ASEAN, allowing ASEAN to assert itself as a regional entity. Nevertheless, interest disparity and development divides among ASEAN members present major challenges to ASEAN. Consequently, reaching consensus on ‘hot’ issues is becoming increasingly difficult, posing challenges to bloc unity. Decision-making based on consensus and non-interference principles also sets limits on the bloc’s effectiveness in addressing common challenges. Due to these fundamental principles, ASEAN is still seen unwilling or unable to give a unified stance on internal matters that may result in regional and global divisions. These issues range from environmental pollution to Rohingya minorities in Myanmar or the rise of the transnational radical Islamic movement in the Malaysian Peninsula. This matter is particularly evident in ASEAN's dispute settlement in the East Sea. In the context of a strong rise of China, which is increasingly assertive in exercising sovereignty in the waters, ASEAN has struggled to shape a common stance, resulting in certain challenges to solidarity and unity among member states that have sovereignty claims in the East Sea, and those countries not involved in the dispute. Encouraging nations to unite for the common interests of ASEAN requires the whole bloc to share the same deep thinking of ASEAN values, identity and common interests. This process is presently encountering difficulties and challenges as development divides, weak connectivity and historical divisions also hinder development cooperation. In that context, ASEAN needs to change itself to adapt. Although the current principles and practices have lead ASEAN to go a long way, this mode of operation may make this bloc vulnerable to the current development in the coming time. Economic growth is an important factor contributing to the increase in incomes and prosperity of member states. In recent years, ASEAN has attained remarkable achievements, with the economy expanding by about five per cent annually and formed a big middle-class force. In early 2016, ASEAN rose to become the 7th largest economy in the world, and only one year later, in early 2017, to the 6th place. By 2020, it will become the 5th largest economy in the world. Despite such impressive growth, ASEAN can still boost its growth rate further to 7 per cent per year. The differential between 5 per cent and 7 per cent seems small but its impact will be overwhelming. ASEAN will double its income every 15 years with 5 per cent growth, and every 10 years with 7 per cent growth. To realise the target of 7 per cent growth, the region must focus on a number of individual national issues such as infrastructure and education. At present, ASEAN also has significant advantages in raising its economic growth rate, most notably the establishment of the ASEAN Economic Community (AEC) and the completion of legal procedures for a single market with integrated manufacturing facilities. If failing to adapt to the AEC environment, local businesses will have difficulty achieving global scale and competition, and consumers will have to pay more for products or services. Growth quality is of equal importance. The biggest concern is growing inequality in many ASEAN countries. The World Economic Growth and Development Report released by the World Economic Forum (WEF) in January 2017 showed that government policies can ensure more equitable outcomes. In addition, the young population is an important factor of concern. With a population of around 630 million, most of whom are young (except in Singapore and Thailand), a ‘golden moment’ in the national economic development journey promises a strong shift in demographics. The increase of the number of people at working age will boost the region's spending, while attracting more investment from the labour force. ASEAN was established in 1967, just two years before the Internet was born. Thus, the impressive growth of ASEAN coincided with the Third Industrial Revolution powered by the advent of computers and information technology. And now, as ASEAN is celebrating its 51st founding anniversary, the world is at the forefront of the Fourth Industrial Revolution, driven by artificial intelligence, robotics, mobile internet, tremendous progress in genetics, materials science and super-cheap automation. ASEAN is currently the fastest-growing Internet market in the world. A recent report by Google and Temasek estimated that the online population of ASEAN countries has increased by 124,000 per day and will continue this rate over the next five years. To achieve success in the next 50 years, ASEAN must be working to address hard questions about how to navigate the pace of technological evolution and digital disruptions. The Fourth Industrial Revolution could bring tremendous benefits to the region, promote financial development, raise access to affordable healthcare, adopt new education forms and create new companies and service industries. Currently, ASEAN has entered a new stage of development. To realise the ‘ASEAN Community 2025 Vision’, ASEAN is working to surmount challenges and success lessons learned in the past 50 years. Accordingly, ASEAN has successfully built a truly integrated, powerful and prosperous ASEAN Community. This is the long-term strategic interest for all ASEAN member states, which requires the responsibility of all member countries to continuously strengthen solidarity, unity and intra-bloc connectivity. To overcome these challenges, ASEAN countries should speed up the harmonisation of national legal systems, balance short-term and long-term interests of each member state with common interests and long-term interests of the whole community, and strengthen the culture of enforcement.